Additionally, NASA is building a spacecraft (called Orion) and a rocket (called the Space Launch System) to get astronauts beyond Earth orbit for the first time since the Apollo moon missions of the late 1960s and early 1970s. Orion launched on its first unmanned test flight last December, and the capsule and SLS are scheduled to fly together for the first time in 2018. Bolden acknowledged that critics have asked the agency to "cease and desist" from the asteroid-capture mission, which aims to pluck a boulder off a space rock and drag that piece into orbit around the moon, where it can be visited by astronauts by 2025. Detractors have charged that this project is a distraction from getting people to Mars, but Bolden countered that it's actually a stepping stone to the Red Planet. "We really are trying to demonstrate we can develop the technologies and the techniques to help commercial companies, entrepreneurs and others get to asteroids and mine them," Bolden said. The agency also plans to test solar electric propulsion during the asteroid mission as a potentially cheaper way to take astronauts through the solar system. Bolden kicked off the annual three-day summit, which examines the options for sending humans to Mars. As several speakers pointed out, this year's conference occurs during a period of renewed interest in manned Mars exploration. For example, Dennis Tito — who, in 2001, became the first private citizen to fly to the International Space Station — is leading a project called Inspiration Mars, which aims to launch two people on a flyby mission around the Red Planet in 2021. The Netherlands-based nonprofit Mars One aims to start a Red Planet colony, with the first settlers arriving in 2027. 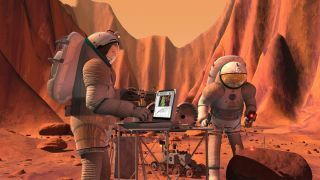 Hollywood is even getting in on the trend, as a movie based on Andy Weir's book "The Martian" (Broadway Books, 2014) will hit theaters in November. However NASA chooses to get to Mars, the agency will need to back up that plan with a strategy that includes a launch schedule, related hardware development and an architecture sophisticated enough for cost estimation, Scott Hubbard said in another presentation. Hubbard is the former NASA "Mars czar" who reorganized the agency's robotic Red Planet exploration program after it suffered several high-profile failures in the 1990s. He now works at Stanford University and is a member of the NASA Advisory Council. NASA also needs to update its 2009 Mars Design Reference Architecture to reflect current technology, Hubbard said, adding that NASA should act quickly to harness the wave of public interest. "If you don't lay out this plan, you will create uncertainty in partners and decision-makers," he said. Others in the Mars exploration community will seize the opportunity if NASA misses it, Hubbard added. NASA is already exploring Mars today with several robotic missions, including the Curiosity rover that landed in 2012, the Opportunity rover that just passed a marathon's worth of driving since arriving in 2004 and several spacecraft in orbit. As successful as these robotic explorers have been, they cannot compete with humans in terms of ingenuity, speed and resourcefulness, said John Grunsfeld, NASA's associate administrator for the science mission directorate. In a panel, Grunsfeld cited a conversation he had with Steve Squyres, a Cornell University geologist who is principal investigator of Opportunity's mission. Squyres estimated that if he were on the Martian surface, he could have accomplished Opportunity's original 90-day mission in just 20 minutes. "One of the purposes of people is to fix the rovers when they break, or fix the Hubble [Space Telescope] when it breaks," said Grunsfeld, a former NASA shuttle astronaut who visited the telescope three times during his career. The Humans 2 Mars Summit began Tuesday and continues through Thursday (May 7). You can watch the Mars exploration summit live on Space.com, courtesy of Explore Mars, Inc.